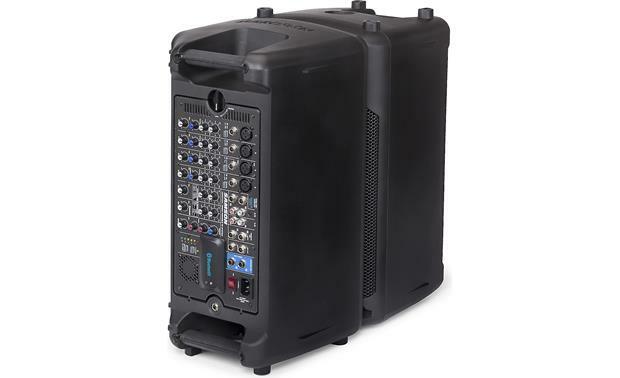 A portable all-in-one PA with a detachable mixer, 40 pounds of portability, and simple setup... that's Samson's Expedition XP800. 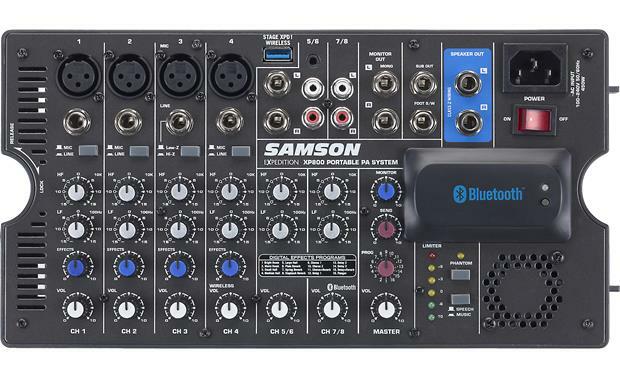 The Expedition 800's mixer controls a host of options. 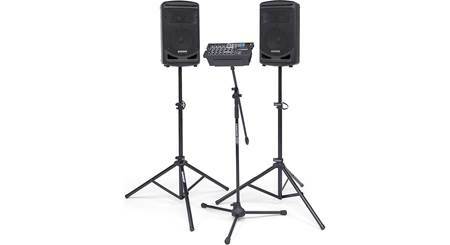 The XP800 features a Class D amplifier which produces 800 watts, plenty of power for an audience of 60 to 100 people. The amp drives a pair of speakers, each with an 8" woofer and 1" tweeter. 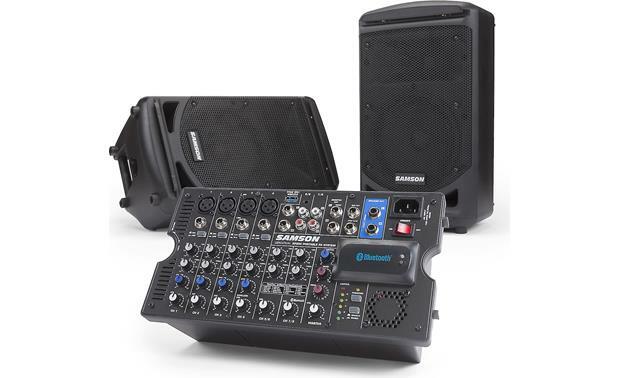 The XP800 also features Bluetooth connectivity for wireless streaming from your Bluetooth-enabled devices and a USB Wireless port to integrate Samson's Stage XPD USB digital wireless systems (sold separately). 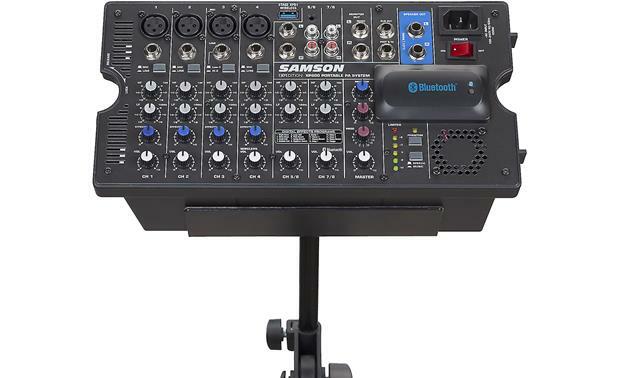 The 8-channel mixer features four mic preamps with phantom power and two stereo inputs. You'll find stereo monitor outputs for floor monitors or augmenting your sound with additional active speakers, while the treble/bass EQ on all channels and the sixteen digital effects settings let you color your sound. The switchable Hi-Z input handles a direct guitar input. You can use the sub output to add a small powered sub to your system. You can pack up and transport the Expedition XP800 as a single unit weighing just over 40 pounds. 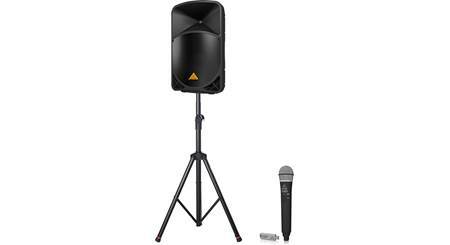 The speakers are designed to tilt back for use as monitors, and they also incorporate standard 1-3/8" speaker stand mounts. Samson designed the system so that people with limited experience can set it up easily, perfect for applications in education, business, and houses of worship. Great product, great full sound, Heavy, but quality, packs up nicely. Samson SDP1 bluetooth microphone hooked up easily. Better than I expected and I expected a lot. 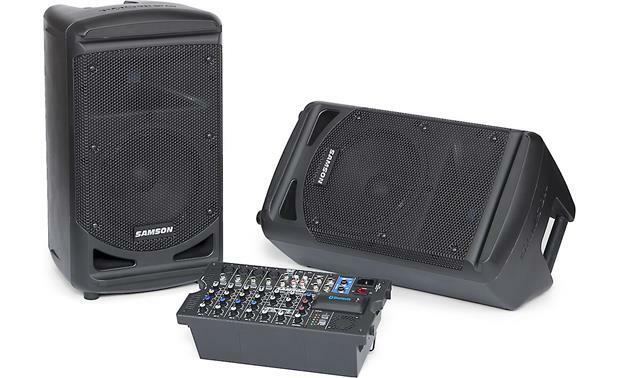 Overview: The Samson Expedition XP800 is a portable PA system that is ideal for education, conferences, presentations, houses of worship, musicians, and singer/songwriters. 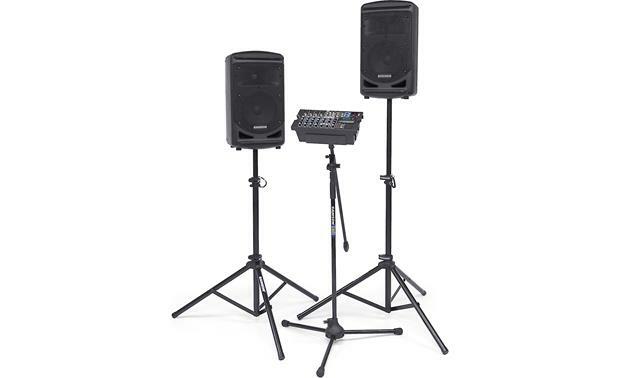 The XP800 includes a removable 8-channel, 800-watt powered mixer that fits into the rear cavity of one of the speakers. 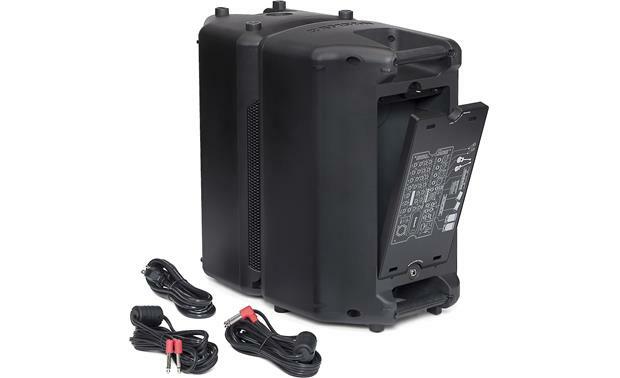 The rear cavity of the other speaker is used for storing the power cord and speaker wires. The two speakers slide and lock together for easy portability. The entire system weighs 41 pounds. Built-in Bluetooth: Built-in Bluetooth technology lets you stream audio from your Bluetooth-enabled device to the XP800 without cables. Once you have paired your device to the XP800, you can control the level using the Channel 7/8 level control. Speakers: The XP800 features a pair of matched speakers with dual 2-way, molded bass-reflex enclosures. Each speaker has an 8" woofer and a horn-loaded 1" high frequency driver that provides 90° horizontal and 60° vertical coverage. 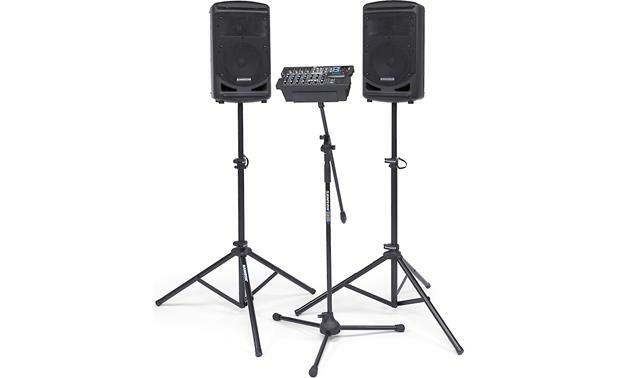 The speakers can be used upright on the floor or a tabletop, turned on their sides for angled floor monitoring, or pole mounted using the integrated 1-3/4"-diameter pole mount receptacles. The cabinets are made of durable, high-impact ABS plastic construction, and weigh approximately 17.3 pounds each. Two 20' lengths of speaker wire are included. 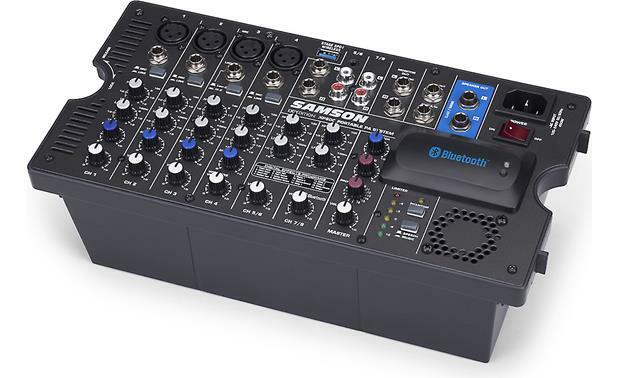 Mixer: The XP800's 8-channel mixer features four Mic/Line inputs (Channels 1, 2, 3, 4) with separate XLR and 1/4" jacks, allowing you to connect microphones or line-level signals, plus two stereo inputs for connecting line-level signals from keyboards, drum machines, and CD or MP3 players. The 4 Mic/Line inputs have +15V DC fixed Phantom Power when connecting condenser microphone. Channel 3 has a dedicated XLR mic input and a 1/4" jack with a Low-Z/Hi-Z switch for high impedance devices for electric instruments with pickups. The four mono and two stereo inputs have a 2-band EQ with a +/-15dB adjustment at 100Hz and 10kHz. The stereo inputs on Channels 5/6 feature two 1/4" jacks, stereo RCA jacks, and a stereo 3.5mm jack. The stereo input on Channels 7/8 are stereo RCAs only. 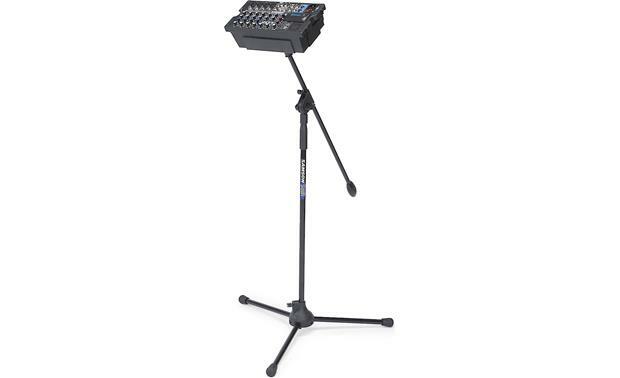 The mixer can be removed for tabletop use with a 1" kickstand to angle the control panel toward you, or left inside the cavity of the speaker. 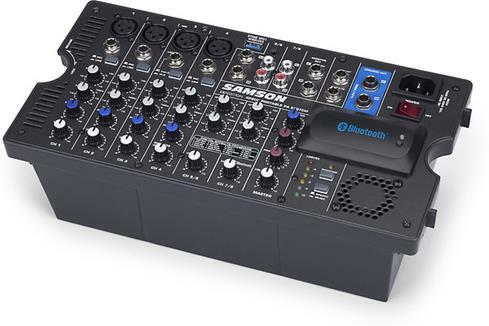 Wireless Input: A Type A USB port is provided for connecting the optional Samson Stage XPD1 or X1U digital wireless USB receiver. The wireless receiver gets its power from the XP800, so there's no need for an additional power supply. The USB Wireless audio signal is routed to the Channel 4 input where you can adjust the level. Effects: The XP800 features built-in 24-bit digital effects that can be added to the mic/line inputs on channels 1 through 4. You can dial in the desired amount of effects using the rotary control on each channel, and the Master Effects Send control. The following effects are available: Bright Room, Warm Room, Small Hall, Medium Hall, Large Hall, Plate Reverb, Spring Reverb, Slapback Reverb, Chorus 1, Chorus 2, Chorus+Reverb, Delay 1, Delay 2, Delay 3, Delay+Reverb, and Flanger. A 1/4" jack is provided for connecting a footswitch to turn on and off the on-board digital effects. Amplifier: The mixer has two 1/4" speaker outputs (8Ω minimum) for connecting the speakers. The built-in Class D amplifier outputs 200 watts RMS per channel and 400 watts peak per channel. The system has a Speech/Music switch to let you select the overall system frequency response. In the Speech position, a 167Hz, 3dB per octave high pass filter is engaged, removing some of the bass for clearer speech amplification. In addition to the two speaker outputs, the amplifier also has 1/4" L/Mono + R Monitor outputs (with level control) and a 1/4" mono Sub Out line output. 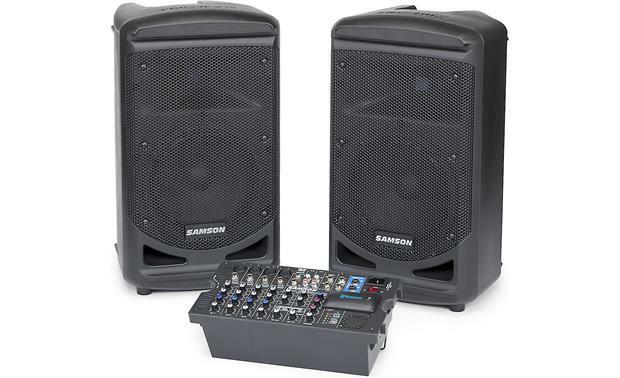 Searches related to the Samson Expedition XP800 800-watt portable PA system with Bluetooth® and USB Wireless port.